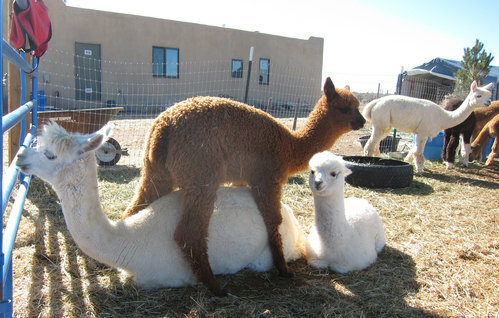 Phi Beta Paca™: Alpacas & Yarns is a farm located in El Prado, New Mexico owned by Frana Biederman. Come to Phi Beta Paca. 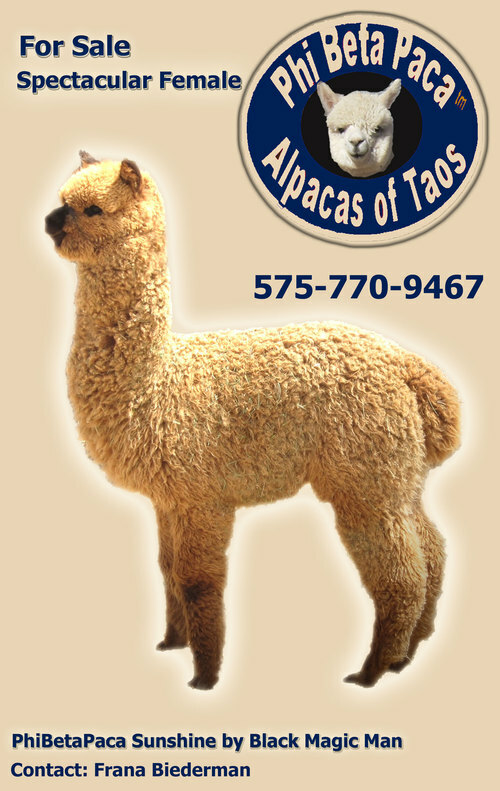 See for yourself what fourth and fifth generation,coming soon, alpacas look like. See the Great Gramd Dam NGG Julietta and her champion daughter Aurora and Aurora's champion offspring, as well as that of her son, Herdsire PHI BETA PACA'S HOT STUFF, 2X Reserve Color Champion for fleece and 2nd in a large halter class at GWAS 2008. Know the milking and birthing history. See for yourself, the development of ultra fine fleeces combined with density. Developing generations of alpacas, rather than going for the quick turnover, the rate of predicting the next generation becomes a high degree of probability rather than shooting dice. Over and over, PHI BETA PACA dams turn out magnificent cria. The Dams add to the genetic potential of the herdsires. They are not wallflowers waiting for the studs to "improve the dam". The breeding males at Phi Beta Paca turn out dynamite cria. 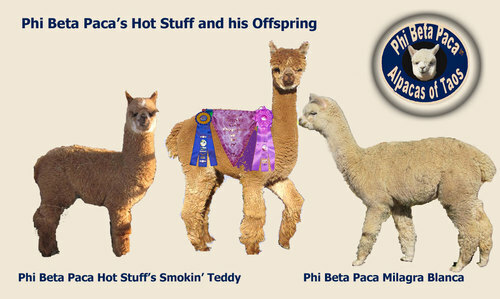 Phi Beta Paca"s Hot Stuff has four offspring on the ground. Phi Beta Paca Milagra Blanca, born in the fall of 2009 will produce the first of the fifth generation. Raquel Jaxon produced Phi Bet Paca Hot Stuff's Versailles, a solid maroon male with black points. Phi Beta Paca Hot Stuff's Smokin' Teddy is a luscious dark fawn, an almost identical copy of his Dad with superior fleece to pass to the next generation. Phi Beta Paca Hot Stuff's Comet, born December 11, 2011, is a fancy: maroon and white, with superb brightness and density. 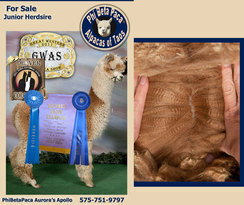 Several farms have reserved breedings to Hot Stuff,s half brother, PHI BETA PACA Aurora's APOLLO for 2012. APOLLO won Blue and RESERVE COLOR CHAMPION at 2011 GWAS and Blue at AOBA Nationals in 2011. To qualified buyers. During payment period, alpacas remain at Phi Beta Paca with six months free board.